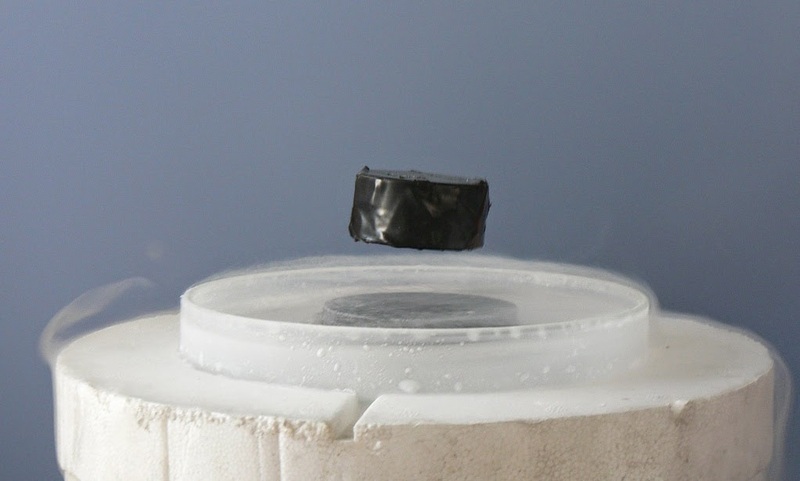 A levitating magnet floats above a superconducting surface. For more than a quarter of a century, high-temperature superconductors materials that can transmit electric current without any resistance have perplexed scientists who seek to understand the physical phenomena responsible for their unique properties. Thanks to a new study by the U.S. Department of Energy's (DOE) Argonne National Laboratory, researchers have identified and solved at least one paradox in the behavior of high-temperature superconductors. The riddle involves a phenomenon called the "pseudogap," a region of energy levels in which relatively few electrons are allowed to exist. Despite their name, high-temperature superconductors are actually quite cold roughly 250 degrees to 350 degrees below zero Fahrenheit. Conventional superconductors, like those used in MRI machines or particle accelerators, are even colder. Even though they are still quite cold, high-temperature superconductors are of special interest to researchers because, at least in theory, they are much easier to keep sufficiently cold and are thus potentially more useful. In general, superconductors can be thought of like an army that prefers the cold. At room temperature, the soldiers electrons are oriented every which way, and they all "march" in different directions. As the superconducting material is cooled past a point called the transition temperature, the electrons begin to couple with each other and "march" in formation, a process known as Cooper pairing. One particular class of copper-containing superconductors offers exceptional promise because they have the highest superconducting transition temperatures, said Argonne Materials Science Division Director Michael Norman, who led the project. The researchers took a magnetic insulator and "doped" it by adjusting the quantity of oxygen present in the material, causing it to switch into a high-temperature superconductor. "With a sufficient quantity of charge carriers added into the system, you can maximize the transition temperature," Norman said. However, the pseudogap the mysterious region of suppressed charge density interferes with this process. "You can dope in carriers, but the presence of the pseudogap means that fewer of them will contribute to the conductance of the material," Norman said. When comparing theoretical calculations of the pseudogap effect with the observed behavior of the material, Norman and his colleagues made a surprising and perplexing discovery. Based on well-established mathematical models, they had anticipated that the pseudogap would cause the superconductivity of the material to vanish, but for some reason the material demonstrated higher superconductivity than predicted. "These models assumed that the pseudogap has nothing to do with Cooper pairing, and that pair formation and superconductivity arise simultaneously, but now we know that this isn't necessarily the case," Norman said. "By demonstrating that what we predicted wasn't the case, we've shown our understanding of the pseudogap isn't as complete as many have thought. In particular, the pseudogap must have something to do with pairing."